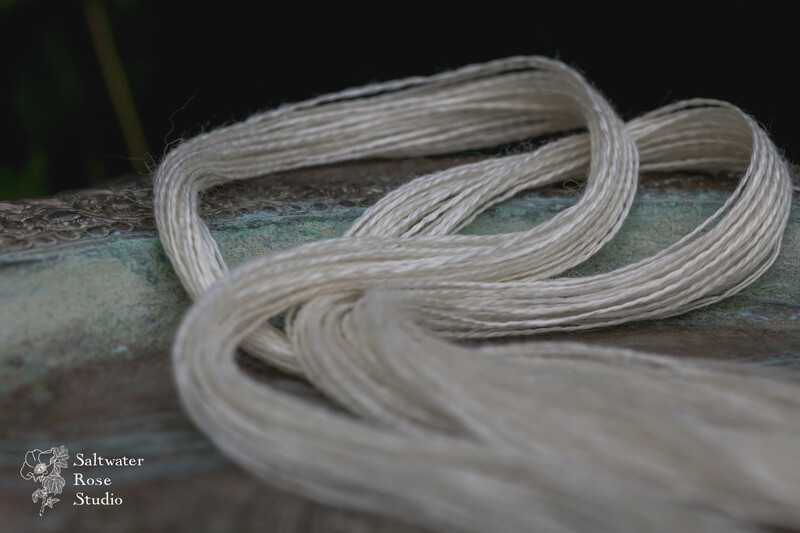 One of the yarns in the Saltwater Rose Studio shop that we love the most is a quieter one. It doesn’t have the mystique of Sea Island cotton, and it isn’t as futuristic as SeaCell, but it is as soft and warm as cashmere, with a luscious sheen, not to mention rare and precious. Blended with beautiful, shimmering mulberry silk, this yarn contains 35% Royal Alpaca. Only the finest quality of the alpaca shear can be classed as Royal Alpaca, making it only 1% of the alpaca fibre in the world. At 18-19 microns, it as fine as cashmere. Alpaca don’t produce lanolin, so for people with lanolin wool allergies, it’s great. Textiles made with alpaca typically have a beautiful drape and minimal memory, so they make lovely knitting yarn for scarves and shawls, or weft in weaving. Enjoy!